Helen Van Slyke, 59, businesswoman turned bestselling novelist; after a brief illness; in New York City. Van Slyke headed the fashion section of the Washington Star at age 19, eventually becoming a vice president at Helena Rubinstein. Adept at identifying women's tastes, she decided in 1970 to apply her talent to writing. 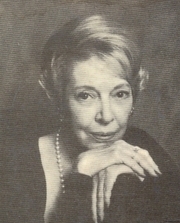 Van Slyke produced eight hugely successful modern romances, including the current blockbuster A Necessary Woman, devised, she said, for "blue-haired ladies in the cocktail hour of life." Helen Van Slyke is currently considered a "single author." If one or more works are by a distinct, homonymous authors, go ahead and split the author. Helen Van Slyke is composed of 3 names. You can examine and separate out names.